When I speak of tons of work, I am not only speaking of the hours I just spent on this snowy Presidents Day holiday in Colorado, reviewing my extensive Guide Page of Cycling Resources, but of the many hundreds of people out there creating an enormous variety of cycling information on a daily basis for cyclists around the world. To update the Pedal Dancer® resource page - one I began in 2010 and have added to ever since - I clicked through to hundreds of web links. I wanted to be sure these fine people where still out there producing their goods and services just for you. What I found is that many have gone to the wayside, vanished or closed shop. I noticed a number of the blogs or podcasts have given up. Perhaps given up is too harsh a description, although I have heard three years is the marker for a blogger. Not surprisingly, some of the brightest have burnt out. If a blogger/podcaster is not hired away (like Dan Wouri to VeloNews) or grows into a much bigger project, hiring more workers (like Cycling Tips) through incredibly hard work (it is known that Shane Stokes at Cycling Tips never sleeps! ), then it takes a lot of self motivation to keep any solo publication going. It also takes many many hours. Those hours directly correlate with missing out on other things in life. For me it was taking care of my own health. I used to spend two to five hours a day exercising. Quick math will tell you it is not possible to do that level of exercise, and manage a job, home owner maintenance, pet care, maintain and grow relationships, and write daily on a blog. Life is going to fail dramatically in a few of those areas. If I made tons of money to match the tons of work, I might be able to justify it, but I don't, and I can't. Some of those cycling publication authors who faded away wanted to refocus on their own riding or on their own family. This happened to The FredCast cycling podcast, after 9+ years on the air. David of The Fred Cast, also sited a distinct loss of interest in pro cycling for his reason to close shop. Which I admit, I suffer from as well. It is not simply my own loss of interest in reading daily about the pros, it is that most of the people I used to talk cycling to, have also lost interest. The truth is we need other people in our lives to sustain interest and form our humor which helps us cope through the ups and downs. There is a reason poets and artists gather together. There is a reason comedians hone their craft around other comedians. There is a reason cycling media need each other. One blogger who authored the There and Back Again blog, truthfully stated he had "run out of things to say," after 4-years of blogging. I find it interesting to watch this happen to others when I too have pondered my future as a blogger. The fact remains that I love the bike, I love a mountain pass, I love compiling information. Yet I admit it is nice to find I am not alone in growing wary of pro cycling, or in justifying my returning interest to the individual who gets out and does it themselves (have you noticed the growth of GCN!). Cycling is growing regardless of the future authenticity of pro cycling. I respect the best of the best. I enjoy watching an athlete at the top of his or her field perform at their best. Yet this is not the only source of inspiration I see in cycling. I can see it in the weekend warrior who gets out and does their best. Perhaps since I am an over-injured cyclist myself, simply enjoying the act of pedaling a bike, now seems good enough. One thing for certain, I have lost interest in local bike racing. I find the environment harsh and unwelcoming. I tried to cover it through stories and photography, but I find the intensity and egos make for an pleasant place to hang out. I go to a marathon or triathlon and feel the palpable energy of personal triumph that seems absent in local bike racing. I feel much more at home at those types of sporting events, or at the top elite level of cycling where human interest stories still grab my attention. Apparently I have created a gap in cycling for myself. I seem to like the best of the best, or the least of the worst. When I look at my photos of Bradley Wiggins and Mark Cavendish, I smile, because it feels like I am glancing at a photo album of old friends. Yet yesterday, when I walked my dog to the local coffee shop, I noticed a man at a table in his long sleeve cycling jersey, slouched in a chair with a relaxed belly, chatting with a friend. He appeared as happy as can be. Nearby, rested his crusty dirty Eddy Merckx bike that was probably 23-years old and had clearly not been washed for the past 15 of those years. In no way was he elitist and in no way did I judge him. I looked at him admiringly and thought, how cool, he is out riding his bike and loving it. He represented many thousands of cyclists around this country. I reason it can never be a bad idea to return to the simple things in life. I explained to a friend recently that I felt I had done so much in cycling and was wondering what would be next. I fondly remember being a newbie where even the slightest up in the road terrified me. I took clinics and read extensively. I met a great training partner and we both headed to France to ride stages of the Tour de France. I formed a women's cycling club in Boulder, Colorado, which sparked a national track champ - Cari Higgins. I went on bike tours to France and Italy. I rode many of the Colorado cycling events and even headed to France to ride the Etape du Tour. I hosted National and World Champions in my home. I joined a bike racing team in Boulder. I returned to Europe repeatedly to climb many of the highest Cols and best routes. I chased the Grand Tours and Classics. I started a blog, became media, worked so hard my own fitness suffered, but I learned the personalities in the biz and the inside scoop. I became a photographer, tried to contribute to the community, and then got disillusioned. Now what? I'm not sure, but it is very nice to know I am not alone in this evolution of cycling. I absolutely agree with Steve, the author of the ex There and Back Again blog, when he stated, "I would like to share with you one last thing – the biggest surprise (and joy) to me was the relationship I built with so many of you..." Without a doubt - now that I have surpassed over one million visitors to my own blog - the greatest joy has been meeting so many people who have broadened and added immeasurably to my life. 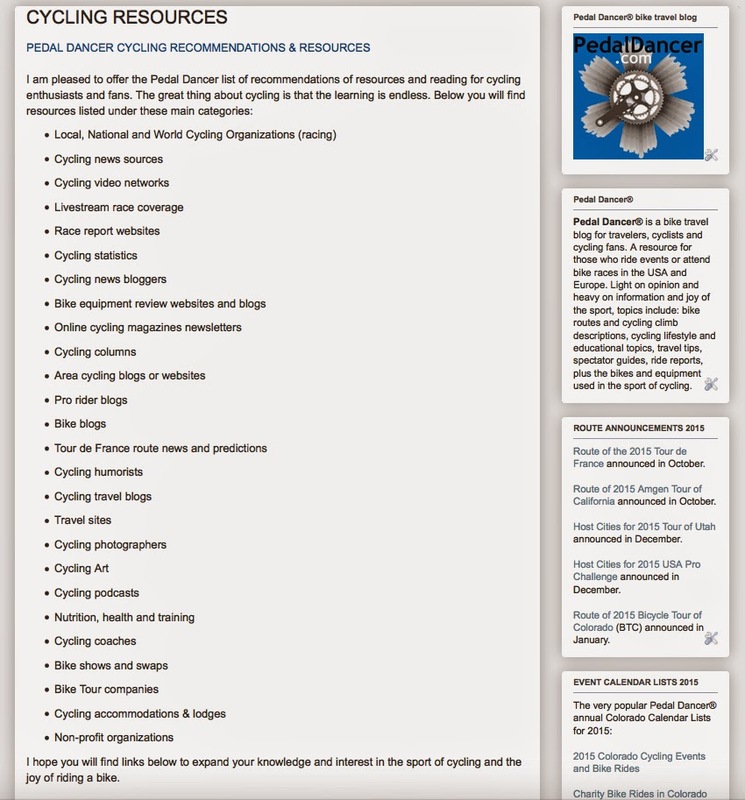 Now please review my long list of updated CYCLING RESOURCES AND RECOMMENDATIONS. You know how I love compiling info! And then come back for more, because I am not giving up! Holy cow that's a lot of information on one blog!